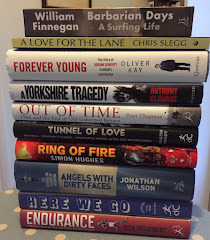 Organisers of the British Sports Book Awards have revealed a longlist for the autobiography category for the 2015 awards. It is a 10-book selection that somewhat bows towards the market, with the pre-Christmas bestsellers well represented, among them the controversial autumn blockbusters from former Manchester United captain Roy Keane and exiled England cricketer Kevin Pietersen. The hugely popular autobiography of motorcyclist Guy Martin and the just-released life story of Indian cricket great Sachin Tendulkar also make the list, along with those of cyclists Nicola Cooke and Chris Froome, footballer Rio Ferdinand and golfer Ian Poulter. From the world of rugby, the autobiographies of former Ireland and Lions captain Brian O'Driscoll and Welsh star Gareth Thomas, whose life story Proud is also on the shortlist for the William Hill Sports Book of the Year, to be announced later this month. Proud was ghosted by Michael Calvin, who won last year's overall Book of the Year award for The Nowhere Men, his fascinating story of the world of football's talent scouts. Now in its 13th year, the British Sports Book Awards recognises the best sports writing across a number of categories. As well as the autobiography of the year there will also be awards for the biography of the year and for the best books from the fields of football, cricket, rugby, horse racing and cycling, plus prizes for best illustrated book and a special category that rewards the best new writer. The winners of all awards will be announced at a prestigious ceremony at Lord’s Cricket Ground, London next May, hosted by Jonathan Agnew. Buy sports books from Amazon , Waterstones or WHSmith.